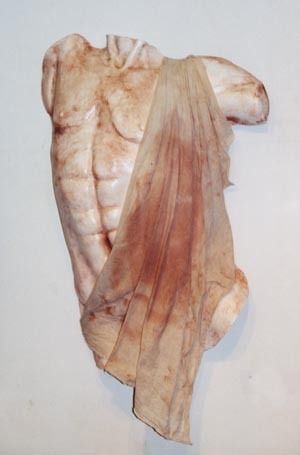 Reminiscent of such great epic heroes as Odysseus and Aenaes, whose adventures often rendered them castaway in hostile and dangerous places, but whose superior sagacity, wisdom and valor led to triumph and victory, this piece gives an unexpected twist to the classical bust. Commissioned by a private collector for his home gymnasium. 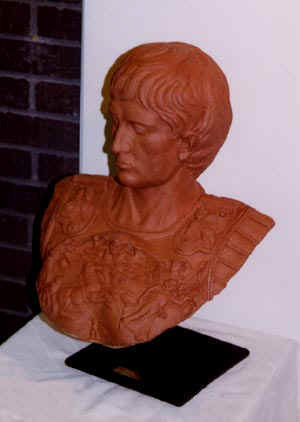 Hand sculpted in stoneware, this piece represents Emperor Augustus. The artist's attention to detail comes through in the distinct willful profile of the Emperor, as well as the minutely defined armor, depicting Aurora in her chariot on the chest and the imperial lions on the shoulders. 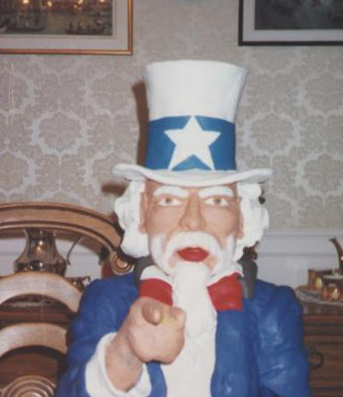 This wax caricature of Uncle Sam was created by the artist while in high school.